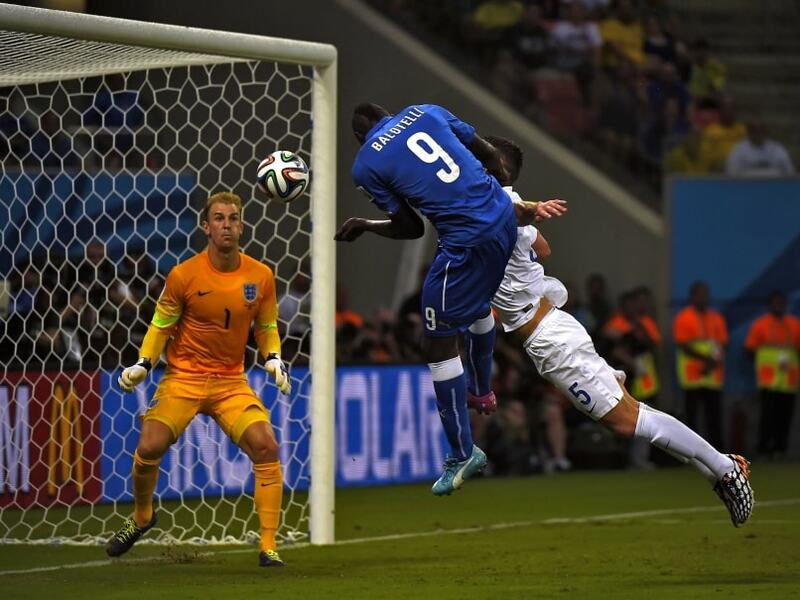 Mario Balotelli scored with a second-half header Saturday to give Italy a 2-1 win over England at the World Cup. The forward lost marker Gary Cahill at the back post to nod home just five minutes into the second half to grab all three points. England manager Roy Hodgson selected an attacking line-up, with young winger Raheem Sterling lining up alongside Wayne Rooney, Daniel Sturridge and Danny Welbeck, Hodgson’s intention was clear, make a positive start to the World Cup campaign. Sterling was England’s brightest spark all night. At aged just 19, the Liverpool man showed no fear and proved to be a real threat after just three minutes when he drove a thunderbolt into the side netting from around 25 yards out. On 35 minutes,Italy took the lead with a beautifully executed corner kick routine with Claudio Marchisio finishing the move. Played in from the right, Andrea Pirlo’s dummy momentarily had England in a standstill and Marchisio had time to set himself up and drill a low shot through the legs of both Rooney and Gary Cahill, and into the corner past Joe Hart. England restarted the game and emerged forward and found an equaliser two minutes later. Rooney, who had been having a difficult time defensively in his role on the left, was freed by Sterling and his cross was met at the far post by Daniel Sturridge, who tapped the ball home. Balotelli nearly regained the lead for his side just before the half-time whistle after drawing Hart out of goal, the Milan striker chipped a ball towards goal that Phil Jagielka desperately headed off the line. Mario Balotelli proved his prowess just five minutes of the re-start, using clever movement at the back post to find the space to meet Antonio Candreva’s cross and head home at the far post. Hodgson will be disappointed with the defensive problems for the goal, however, with Leighton Baines being beaten too easily down the flank and how Cahill was not tight enough on the former Manchester City man. England pressed again and should have equalised through Rooney and a great effort from substitute Ross Barkley but the goal never arrived and Hodgson’s men have plenty to do in their remaining two matches. Meanwhile, it could have been worse for England is a Pirlo free-kick that totally fooled Hart in goal had not crashed off the crossbar in stoppage time. However, the win puts Italy in a strong position to qualify for the second round with a game against Costa Rica to come up next, they will look to cement their place in the last 16. ENGLAND: Hart, Johnson, Baines, Cahill, Jagielka, Gerrard, Henderson (Wilshere 73), Sterling, Rooney, Welbeck (Barkley 61), Sturridge (Lallana 80). ITALY: Sirigu, Chiellini, Darmian, Barzagli, Paletta, De Rossi, Pirlo, Verratti (Thiago Motta 57), Candreva (Parolo 79), Marchisio, Balotelli (Immobile 73). GOALS: Marchisio 35, Balotelli 50.